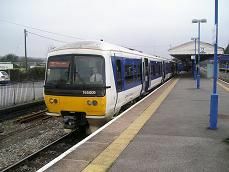 Princes Risborough station is a three platform station with a bay platform for the trains to Aylesbury. After getting off my train from Paddington I have three quarter of an hour wait for my Aylesbury train. I decide to go into the town, but it is a lot further than I think and have to rush back to make sure I catch my train! The train leaves on time and sadly it is not the bubble car that is used on this line sometimes. We leave the main line immediately and go past the old signal box on the left, which is now all boarded up. We go along a single track and onto an embankment as we skirt round the western edge of Princes Risborough. There are plenty of houses on the right, but open fields on the left. We come to a stop at Monks Risborough, which is still part of Princes Risborough. It is the most basic of stations with a single platform and no shelter. The ticket machine has a roof on it, but the station is open to anyone. No one gets on or off the train. There are open fields on both sides now, but we don't go very fast. We go into a cutting and then emerge at Little Kimble station. The original station building is still standing, but is now a private house. One person gets on. The land starts to change from flat to hilly, with cows grazing on the left hand side. It is a very English country scene with green fields all around, punctuated by the occasional farmhouse. We slow down for a level crossing and then speed up as houses start appearing on both sides. We slow down as we come into Aylesbury and join the mainline from London on the right, before arriving on platform three of Aylesbury station. We pass the bubble car on the left which is stabled to the west of the station along with a few other diesel multiple units. The line continues north out of the station to Quainton Road and from December 2008 trains will run through here as far as Aylesbury Vale station.